If you're into the kind of action game where you can mow down hundreds of foot soldiers in seconds while using obscenely flashy special attacks, then you likely know about Dynasty Warriors. 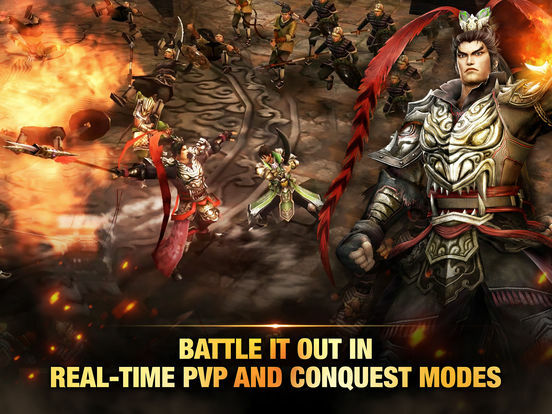 If you're looking for something like that to play on your phone, you should know about Dynasty Warriors: Unleashed. Simple though the action may be, you'll want to properly prepare before you fling yourself into the enemy hordes. Beef up your officers. You can use unwanted officers (and some items) to increase another's level, up to a maximum based on their individual star ranking. Naturally, the higher the level the stronger they'll be. Stars are important. Officers with higher star ranks are able to reach higher maximum levels. In addition to this you can eventually unlock the ability to merge two max-level officers of the same rank to make a random one that's one rank higher, or you can upgrade a favorite officer to the next rank once they hit max level in much the same way. Give everyone gear. Any officers you're going to put to use should be equipped with a weapon and armor (to start, but you'll unlock a lot more types as you progress). More gear means even more power. Gear can be merged and upgraded just like officers. Same general rules apply - you can use unwanted stuff to improve the stuff you do want. Try to have one of each element on your team. The three officer elements (Fire, Water, Wood) work on Rock-Paper-Scissors/Pokemon rules. Water beats Fire beats Wood beats Water. Having one of each on the team makes it easier to capitalize on an enemy's weakness. Ready to kick dozens of butts at a time? Here's what you should keep in mind. Look for elements. Enemy officers (minus the occasional boss) all belong to an element. Look for the colored circle next to their health bar to see which one they belong to and switch your own officers to take advantage. Familiarize yourself with your favorite officers' specials. Different specials behave differently (area of effect, attack in a straight line, etc). By knowing how they perform you can utilize them more successfully for things like crowd control or taking on enemy officers. Look for shiny objects. Things like barrels and some weapon racks can be broken and will sometimes drop things like gear or power-ups. These are usually worth picking up. Dynasty Warriors: Unleashed falters a little bit when it comes to competitive play, but overall it makes for a really solid and fun time. The simplistic action is actually a really good fit for mobile, and there are more than enough extra bits like equipment upgrades and bonus modes to keep you entertained for quite a while. Definitely give it a look if any of that sounds the least bit interesting to you. My track record for reviewing mobile games based on big name franchises hasn't been the greatest lately. Most of what I've played has been disappointing at best and aggravating at worst, so as you can imagine I wasn't going in to Dynasty Warriors: Unleashed with high hopes. Maybe it's partially because my spirits had been dashed repeatedly, maybe not, but whatever the reason I actually kind of love this game. 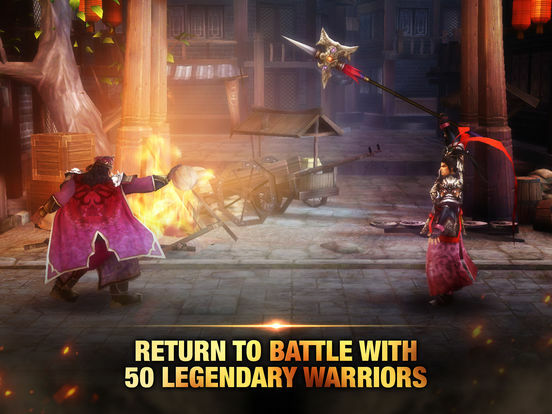 Dynasty Warriors: Unleashed is basically Dynasty Warriors adapted for mobile devices. The camera is fixed in an isometric angle (think Diablo) rather than being set over your character's shoulder. The missions are much smaller in scope, with more contained battlegrounds and none of that rushing to save an outpost from being overrun business. There's even an Auto attack button that makes your character run around and target enemies on their own. Surprisingly, this is kind of a perfect fit for the platform. Dynasty Warriors has always been about mindless action, but when it's on my phone it suddenly feels right. It definitely helps that the missions themselves are much shorter, of course - finishing in under three minutes is required if you want to earn all three stars for a given level. Having an Auto attack option is also great. You don't have to use it, of course, but enabling it during story missions allows you to focus on things like timing your special attacks and switching between the three officers on your team. Plus your character will automatically run towards the next objective, which is actually really handy because sometimes it can be tough to tell where you're supposed to go. There are also a lot of little systems behind the action that I enjoy quite a lot. Most of it's par for the course in a lot of freemium games, but still, things like being able to find and upgrade equipment to further enhance your officers makes for a nice extra bit of control. Officers can be leveled-up by using other unwanted officers, they can be upgraded to more powerful forms, you can improve their skills by merging them with duplicates, etc. On top of all this, there are also quite a few extra game modes to explore once you get far enough to unlock them. The Campaign is still where I spend the bulk of my time, but I really like trying to earn S ranks in the Daily Trials or the occasional Boss Fight. Sending a team off to mine for resources via the War Supply is also a nice little extra. Of course there are also competitive modes like Skirmish or the Arena. Unfortunately, this is the one area where Dynasty Warriors: Unleashed stumbles a bit. It's not that being able to fight other players for bonus items is a bad thing in itself, but the matchmaking is kind of bad. The Arena is generally okay, though lag can sometimes cause problems when you think you're doing well only to suddenly find yourself rapidly losing health while also being stunned. Skirmish is the real problem. I get that it might not be easy to always match teams with relatively equal power levels against each other, but when my three officers have a combined strength of around 70K and I'm up against someone else's officer (ONE officer) with a level of over 170K, well that's just stupid. Lastly, there's the problem with the battery. It's not a surprise, really. This game looks pretty good, has lots of flashy visual effects going when you use special attacks, and it's always online, so the fact that it's a battery hog makes sense. That doesn't mean I have to like it. Dynasty Warriors: Unleashed was one heck of a surprise. I didn't really expect it to be good, much less great, but so it goes. Anyone, fan or no, should be able to have fun with this. If you enjoy action games it's definitely worth checking out.